Sorry this blog is a bit late. My computer charger broke, but I’m borrowing one at the moment. So how many of you remember going to summer camp? I sure do. You get to do a lot of swimming, hang out and meet new friends, sleep outside, and maybe miss your parents a little. You have so much energy the whole time and then your parents pick you up and you sleep the whole car ride home. Well I never gave much thought to the counselors at camp when I was young. I appreciated them and all, but it was their job to take care of us, right? Two weeks ago White Oak ran an overnight summer camp with 14 7-12 year olds. I worked this camp instead of doing farm labor for the week. I have so much respect for anyone who works with children, they must be, or hopefully they are, the most patient people on Earth. Here’s how a typical day ran down: We started morning chores with the kids (taking care of the animals) around 7am, then we would come up and eat breakfast (there were pretty much 4 people staffing this and one of us was always cooking food). After breakfast we would have morning circle and then break off into two groups for morning activities, one adult to each group. I made granola with them and harvested blackberries to put in the granola. I also harvested plums and made plum jam with them. They really enjoyed both the activities they were especially excited that they all got to take home some canned plum jam. Some of the other activities included knot tying, potato harvesting, fishing in the pond, etc. After the first activity they would eat snack and then switch groups to do the other activity groups (warning for anyone: this age group is ALWAYS ALWAYS ALWAYS hungry!) After morning activities they would have lunch and then we would have an hour of quiet time (my favorite time 🙂 ) where they would read, draw, play with clay, etc. Then they would have about an hour and a half of swim time. Then another snack (ALWAYS HUNGRY!) Then an afternoon craft (painting, stained glass boxes and picture frames, journal making, etc). Then we would have dinner. After dinner they would play some games, or we would structure some games. Then we would have evening circle. Each night we had a male counselor and a female counselor sleeping out with he kids. We would read to them for about an hour before they went to sleep. But they always wanted to stay up later than me. I don’t know how those kids still had energy after all they did all day. I slept next to a girl who was a sleep fighter and got kicked in the face a lot until I gently dragged her as far from me as I possibly could. There were some scary situations. We had a girl during a swim test who was out in the pond and almost started drowning and I had to save her. That’s probably the first time I’ve ever saved a child’s life, especially in water. We were also on a hike and a bunch of didn’t see the snake coiled on the ground so we stepped over it and then one girl almost stepped on it… it turned out to be a rattlesnake. That was my first time seeing a rattlesnake and I wasn’t too happy that it was with a group of kids. It got up into striking position, but when we backed off so did the snake. P.S. Sorry the only photos are from the talent show. I didn’t exactly think to carry my phone around a place that doesn’t have service with kids all week! Last week there were two Rogue Farm Corps classes! 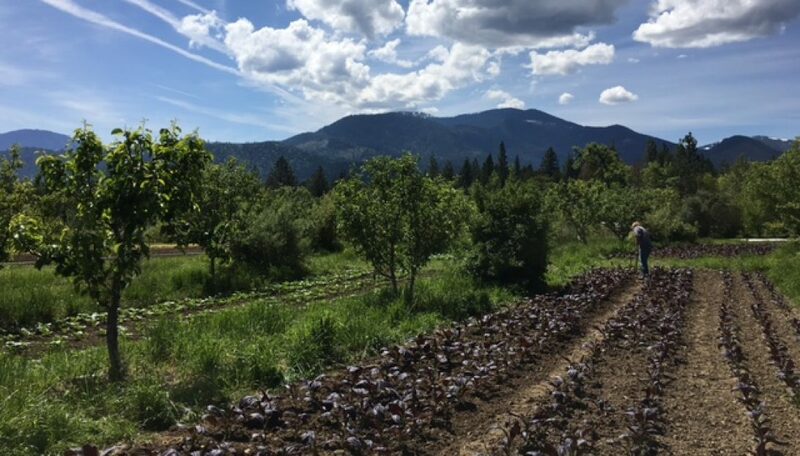 Integrated pest management and Apple Outlaw orchards. It was a very exciting week for visiting farms and learning new things! The first was on Thursday and it was about integrated pests management. We learned about different pests and then we went out to some gardens and practiced identifying them. We spent a lot of time on aphids and parasitic wasps. Parasitic wasps are pretty amazing when it comes to killing aphids. The females lay their egg inside the aphid and the wasp grows inside the aphid, essentially turning the aphid into a mummy when the wasp is ready to leave its host and enter the world. The signs for Aphids are sticky stuff on your fruit trees and they are typically under damaged leaves with spots on them. We used some really cool bug catchers, they worked like a suction! It felt kind of like ghost busters, but for bugs instead of ghosts. The second class, on Sunday, was at an apple orchard. The name of the farm is called Apple Outlaw. It’s on Thompson Creek in Applegate, OR. The farm started out selling organic apples, but they struggled because there delicious organic apples didn’t always look so great, so people didn’t want to buy them. So, they started pressing them and making juice. But, recently they have expanded to making hard cider. They are trying to grow lots of varieties of apples now and continue to expand their cider business. The cider business, like a lot of businesses, has a lot of competition. So, you have to make cider that not only stands out, but also tastes good, and then you need to be able to market it! It’s a family business, and everyone seems to play their role pretty well. They seem to be doing a really good job business wise. We learned a little bit about grafting trees, and got to check out a lot of his grafts. Before Apple Outlaw bought the land there was a lot of red delicious trees, which nobody really likes and it doesn’t really make great cider, so they’ve been grafting off of a lot of those trees. We also learned about pruning, which seems like it’s something that the more I hear about it the more I feel that I need to actually do the pruning to understand what’s happening with the tree. Overall was a good experience. Speaking of fruit tress, this week has been the week of thinning (not pruning) at White Oak. Thinning is when you remove some of the fruit from the tree so that you A) leave room for the other fruit to grow B) Limit bruises and places for pests to go crazy C) Save your branches from breaking by removing some of the weight from the tree. That’s been the main focus of the week, other than harvesting and preschool. This week was animal themes for preschool. We focused on the life cycle of animals and how each animal was given something to help them survive here on earth. We also made masks and spent hours harvesting raspberries for snack 🙂 Little kids are exhausting. Especially 14 kids around 3-6 years old. Friday I technically had the day off, but I chose to put in some extra hours. I helped Taylor and his friend Josh cut down some trees and strip the bark of them to make posts. The posts are for a building that the farm is currently writing a grant for. It was very hard work and I’m very sore today. I was expecting it to be a little easier. It was in the shade, which is a nice bonus when you’ve been in the 90 degree sun all week. Although I was so covered in mosquito bites and poison oak by the end of it that I think I would have chosen the sun. Saturday was a day of blueberry picking and swimming! The farm crew went and picked blueberries. There were 5 of us and we each picked over 10 lbs! We are going to make cheesecake, jams, pancakes, and freeze a bunch too; but for now I just made some muffins with cinnamon sugar on top 🙂 YUMMM! I ate so many blueberries, it was blueberry heaven. Then we went down to the Applegate river and went swimming. There were a lot of people there; drinking beer, floating of rafts, barbecuing. It was a really strange scene coming from the farm. It’s always funny to get a taste of America after being on the farm for a long period of time. The 4th of July will not be very exciting here! We are not allowed to have fireworks, because we are officially in extreme fire danger season. This means no running a weed whacker during the day, no fireworks, absolutely no fires. When I get home the first rain we have I’m just going to go run around in it. It’s only been 3 weeks since the last rain and I already miss it so much. I won’t see rain again until I get home. The second thing I’m going to do is have fire. I miss fire. There is a parade in Williams on the 4th, but I will be harvesting and working the market booth. Heat the milk to 86 degrees F over 15 minutes. Shut off the heat. Sprinkle starter (1/4 teaspoon Meso II) over the milk and let it sit for 5 minutes to rehydrate (or “waken up”, as it lives in the freezer). Stir in an up and down motion. Then cover the milk to maintain temperature and let it sit for 45 minutes. Add rennet (1/2 teaspoon liquid rennet diluted in 1/4 cup cool non-chlorinated water) and gently wish for 1 minute. Cover and let sit for 30-45 min., or until curds give a clean break. maintaining temperature, cut curds (at bottom of whey still in pot) into 1/2 inch pieces and let sit for 5 minutes. Stir for 5 minutes. Let sit for 5 more minutes. Heat 2 quarts of water to 140 degrees F and maintain that temp. When curds sink to bottom of pot ladle of whey, then add enough of the 140 degree water to make the curds 92 degrees F (start with 2 cups). Gently stir for 10 minutes, then let the curd settle again. Ladle off enough whey to expose the top of the curd. Then add enough 110 degree F water to make the curd 98 degrees F. Holding the curd at that temperature gently stir for 20 min, or until the curd have shrunk to the size of tiny beans. Then let the curd settle for 10 min. Line and 8 in. mold with a damp cheese cloth and place it on a drying rack. Warm a colander with hot water and one with a wet cheese cloth. Drain off whey and transfer curd into the colander. Let strain for 5 min. Using your (clean) hands, break off 1 in. pieces/chunks of curd and transfer int the cloth lined mold. Fill the mold with all of the curd. Press the curd into the mold as you go. cover the curd with the cloth and press at 10 lb. for 30 min. Remove the cheese from the mold, flip it, and then press again at 15 lb. for 6-8 hrs. Make 2 quarts of medium- heavy brine in a non-corrosive container with a lid and cool at 50-55 degrees F. Remove cheese from the mold and cloth. Place in brine and soak at 50-55 degrees F for 8 hrs or overnight. Remove cheese from the brine and pat dry. Place on a rack and air dry at room temp. for 1-2 days, or until the surface is dry to the touch. Place on a mat in a ripening box, cover loosely, and age at 50-55 degrees and 85 % humidity for 1 wee, turning daily. Remove any unwanted mold with cheesecloth dampened in a vinegar-salt solution. Coat the cheese with wax and age at 55 degrees F for 1 month and up to 6 months. .. And that’s the complicated time-consuming process of making Gouda!! I figured I should tell you all a little about the Williams farmers market. Williams Farmers Market happens every Monday from 4-6:30. It’s the best place to be in Williams on Monday. The same people come every week which means I actually know a lot of the town people just from market! Every booth has something special to offer. There’s our booth which sells all the fresh veggies and fruit that your heart desires! There are booths that sell bread, cheese, meat, artwork, instruments, ceramics, spices and sauces, kombucha, baked goods, and my personal favorite: popsicles. It’s very easy to spend a lot of money at market so you really have to limit yourself. the bread, kombucha, and popsicles are my regular purchases. Everyone at market is so friendly and it’s such a good way to start the week. It’s a tiring event after harvesting all day, but it is so worth it! This weekend I volunteered at the library. I worked with some little kids and taught them about different pollinators and then we got to planted some seeds that would attract lots of pollinators and sent them all home with a pot 🙂 It was adorable and lots of fun. We also made origami butterflies! Emily, the other intern, and I also made cheese on Sunday. It was our first time making cheese and we did it all on our own. We made Gouda!! It will be about a month until we can actually eat it, but I’m so excited. Making cheese is a very complicated process. You have to follow directions so carefully! Emily and I decided we want to try to make a new kind of cheese every week! The sad part is that by the time a lot of them are done aging we will already have left the farm and won’t get the chance to try them 😦 But I’m excited to go on a cheese making adventure and learn through success and mistakes! In terms of farm news there are so many cherries.. we cannot keep up with harvesting them so the crows are getting to them. Every time I look up when I’m out in the field I see a crow with a red beak (full of cherries). My back has been really sore so I’m hoping to bike into town tomorrow for a yoga class. 4th of July is coming up! I’m very sad because I found out that there are no fireworks here .. it’s fire season so fireworks are prohibited. I will sure miss them and possibly celebrate 4th of July in August when I’m back on the east coast. I hop all you other farmers out there are staying sane.. keeping your backs in good shape, not getting too hot, avoiding ytpical farmer problems, and best of all I hope you are all getting to eat lots of fresh veggies! So in terms of my farming adventures things have pretty much been the same. Harvest, weed, mulch, mulch, weed, lay out drip tape, fix drip tape, chase chickens around while trying to get them into their coop so I can go to bed. It’s exhausting, fun, repetitive and exciting, and a lot of work! I like farm life though. I get into a routine. I especially like going to bed at night here. Nights here are cool so it feels so good after a hot day to go to my tent, get in my sleeping bag, and listen to an audiotape for 5 minutes before I pass out. The work is satisfying and rewarding and so it gives me a good night of sleep. This past Sunday I had another farm course. For this class I got to go to Ashland and take a beekeeping course. The coarse was with a girl who actually calls herself the bee girl. She had so much knowledge about bees! We had 2 hours of classroom time and then we got to go check out her hives for a couple hours. She has 50 hives! So many bees.. It was incredible. We suited up and got to go in the hives. Honeybees are amazing. They are so sweet and gentle and truly do so much for us. It was a magical experience to be so close and at peace with these cute and fuzzy little pollinators. Also exciting news this week. Today I got to participate in preschool! Pre-school (which we decided we need to rename cause some of the kids are to big for pre-school) is for kids ages 3-5 and they come twice a week to the farm to learn and adventure around our farm. Today was my first day participating and there were 10 kids (not the whole group .. there are 17). We sang, did kid yoga, made raspberry muffins (it was kind of chilly today), learned about herbs, made songs about herbs, harvested herbs, ate cherries, dressed up all crazy and sang and danced. It was a blast, but it was so draining! The kids leave at 1 and then after we take a little break we have to go back out and do farm work, which is so hard to find the motivation for! I think this Friday I’m going to go work at a beef ranch for the day and see if I can work there on some Fridays. Saturday I’m going to try to start volunteering at the Library in town. The library does a lot of kid education stuff and they have a garden so I told them I might come down and help a few times.. We will see if I’m to exhausted from kids by the weekend to go work with more kids! There is so much fruit at white oak. There are currently strawberries, raspberries, and cherries. Soon we will also have apples, pears, peaches, figs, blackberries, and more! This is why I could write a whole blog on fruit trees. I could write about how good they taste warm and fresh out in the field when you’re hot and tired. Or how mulching the trees with bales of hay in 90+ degree weather and getting itchy, irritated skin while simultaneously cutting back thorns from around the trees does actually pay off. Or I could write about how cute it is when the 5 year old who lives on the property spends all her time in the cherry tree. She calls out “help” after only being up there for about a minute because most of the cherries are out of her reach. When she can reach them she is “as sweet as a cherry” and brings some that she picks out to you while your working in the field. Even the goats like the fruit trees. When moving them to another pasture they like to try to pull you toward them so they can munch on their leaves. The majority of my stomach aches here come from eating copious amounts of fruit.. especially the raspberries. It’s takes the longest to recover from an over-eating-raspberries stomach ache. The fruit here is really something special.